Dream of places near and far with these continent-themed pillows, handmade by artisans in South West India. 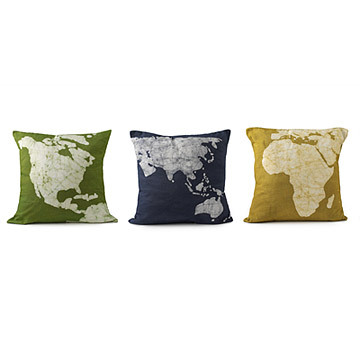 Rest your head close to home on the North/Central America pillow or drift off to far away lands with the Asia/Australia and Africa/Europe versions. Either way, you can rest assured that these bright and cheery pillows help the greater good by providing fair wages and development opportunities for artisans in South West India. Pillow cases are made of cotton and decoration is applied using Batik, a traditional Indian art to create patterns on fabric. Set of three pillows. Handmade in India. Click here to see how they are made. Pillow inserts are 100% polyester fiber fill. Both pillowcase and insert are Machine washable. The item was packaged very well, although it's size gave it away (couldn't avoid this). My wife really loved these pillows. They are well made and the painting looked amazing! They're throw pillows, so they basically live on the couch and make it comfier. We liked the design, since we travel a lot, and the colors matched our decor well. The actual colors of the pillows are a lot darker than they look on website. Bought these to put on the couch in the living room and they are great. Very fluffy and comfortable! Very quality product. Well worth the money. I couldn't be happier with my purchase! These pillows are really neat and perfect for someone who travels. They go well with a lot of different furniture/styles too. The person I gave them to loved them and thought they were really interesting and different! I love the design of these pillows. I washed them upon receipt, and they held up perfectly in the washer. I ordered new down inserts for them because we do a lot of lounging on this couch, and when I measured them they were 18" instead of the 20" shown on the website, but that is my only issue. I would absolutely purchase these again. Bought these as a gift and loved them so much I bought them for myself as well! They look great on our sectional!